The Scillonian is the passenger ferry that sails between Penzance and the Isles of Scilly. Here, the vessel is depicted under an early morning sun attempting to penetrate the mist. There is a serene nature to this work established through the sea's calm and the expansiveness of what lies beyond the harbour walls, enhanced by the water's seamless transition into sky. The work is dominated by neutrals, only for the overall effect to be heightened by the use of red in some of the moored boats and buoys. The sun's scattered reflection also adds to the visual excitement. 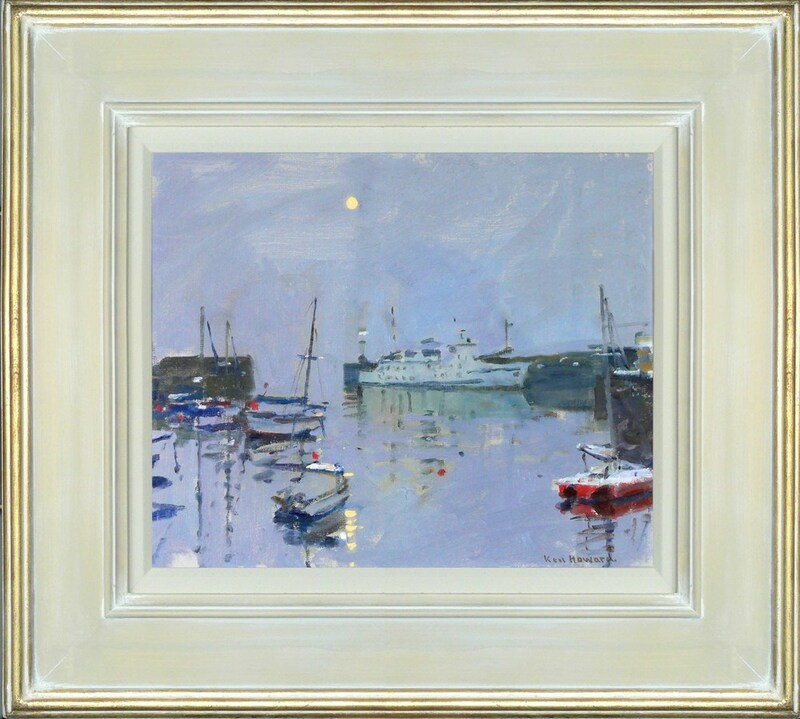 Ken Howard, born in 1932, is one of Britain’s most popular figurative artists and is best known for his ability to capture light, be it the reflections from an interior’s polished floor, or the dazzling contre jour effect of sunlight off Venice’s canals. He studied at the Hornsey College of Art between the years 1949 to 1953, and the Royal College of Art from 1955 to 1958. In his final year at the College he won a British Council Scholarship to Florence. In 1973 and 1978 he was the Official War Artist to Northern Ireland, and throughout the 1970s worked in various locations, including Germany, Cyprus, Oman, Hong Kong, Nepal, Norway, Canada, Belize and Brunei with the British Army. His passion for painting is summed up in the opening lines of his autobiography Light and Dark: "I have always believed one does not choose to be an artist. There is no choice: it is something you have to do, and I often jokingly describe it as an illness. Drawing and painting is a way of seeing, a way of revealing the world. At first you seek to discover this vision for yourself; later on you hope to reveal that world to others. Painting is an obsession, and those in its grips are not easy to live with. Partners and families have to understand that obsession in a painter, to accommodate it and not be jealous of it. It is not a question of loving one thing more than the other: they are completely different forms of love." Howard’s first solo show was held at the Plymouth Art Centre in 1955 and since then he has held over 35 one-man exhibitions. He was elected a member of the New English Art Club in 1962, the Royal Institute of Oil Painters in 1966, the Royal Society of Painters in Watercolours in 1979, the Royal West of England Academy 1981, Honorary Member of the Royal Society of British Artists in 1988, Royal Academician in 1991 and President of the New English Art Club in 1998. Among his numerous awards are first prize in the Lord Mayor’s Art Award in 1966, a Prize Winner in the John Moores Exhibition in Liverpool in 1978, first prize in the Hunting Group Awards, and the Critics Prize at Sparkasse Karlsruhe in 1985. Examples of his work can be found in Plymouth City Art Gallery, Sheffield Art Gallery, Hove Museum and Art Gallery, Guildhall Art Gallery, London, Ulster Museum and Art Gallery, the Imperial War Museum, London, and the National Army Museum, London. In 2010, we was awarded an OBE at the Queen’s Birthday Honours. Howard, K., 2011. Light and Dark - The Autobiography of Ken Howard. Royal Academy Publications. Periodically we send out a newsletter via email with notifications of new works and upcoming exhibitions. Click here to enter your details and sign up.